Pin Loom Travel Tags -or- how to keep a watch on your luggage. Since about 93% of all luggage carried these days is the same style and color, many people decorate their suitcase with a pink ribbon or bright tag. 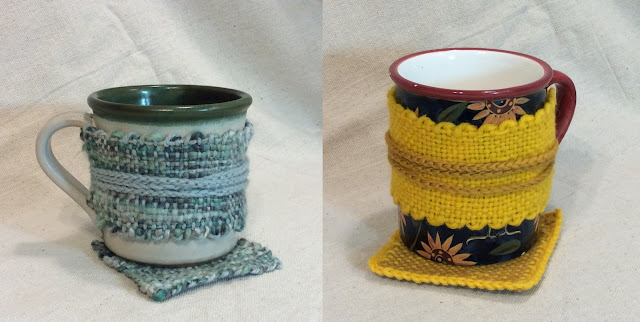 This makes a great opportunity to add a pin loomed touch to your travel and upcycle a thrift shop find-- like an old watch or bracelet. 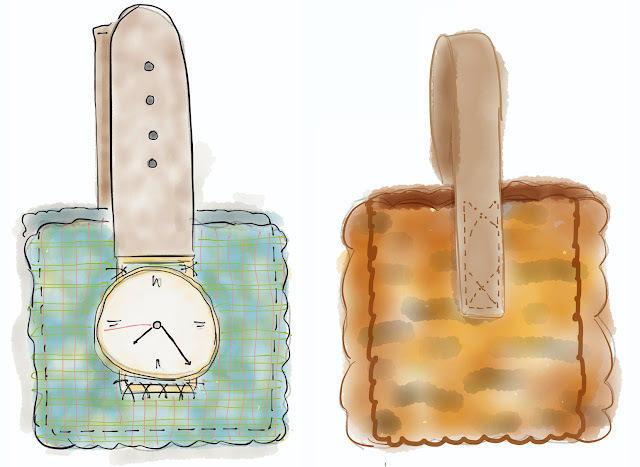 This project requires two 4x4" squares and a watch with a band or other jewelry with a strong clasp. Take the watchband off of one side of the watch and attach the two halves of the watch to two squares. Then sew the two squares together to form a pocket. Drop your name and address into the pocket, it will be safe in there in case its needed, and buckle the watchband around the suitcase handle. Now there will be no question about identifying your luggage with ease. It goes without saying, although I'm saying it anyhow, that you need to choose a watch that is no longer working. If you use one that is still running I can pretty well guarantee that it won't be working by the time you claim your luggage. If anyone is wondering at this point, "why a watch?" 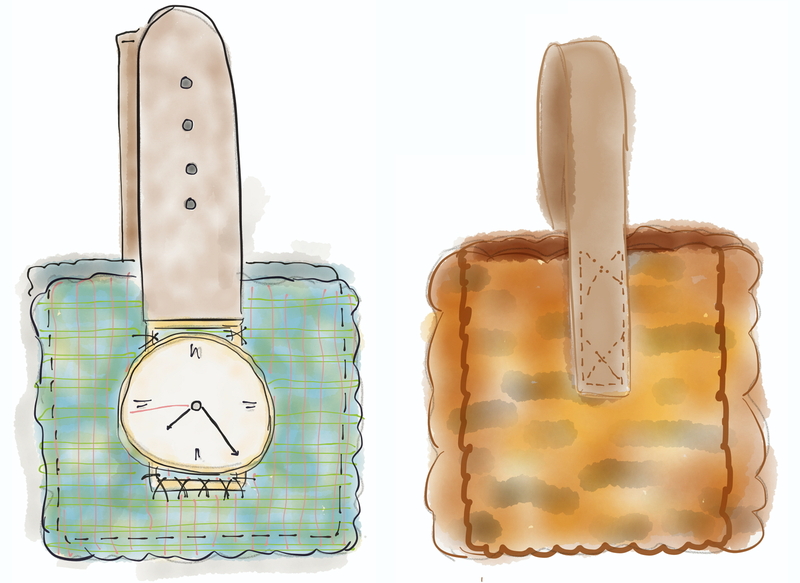 I think it would be a fun, funky use for an old watch and it comes with its own strap. 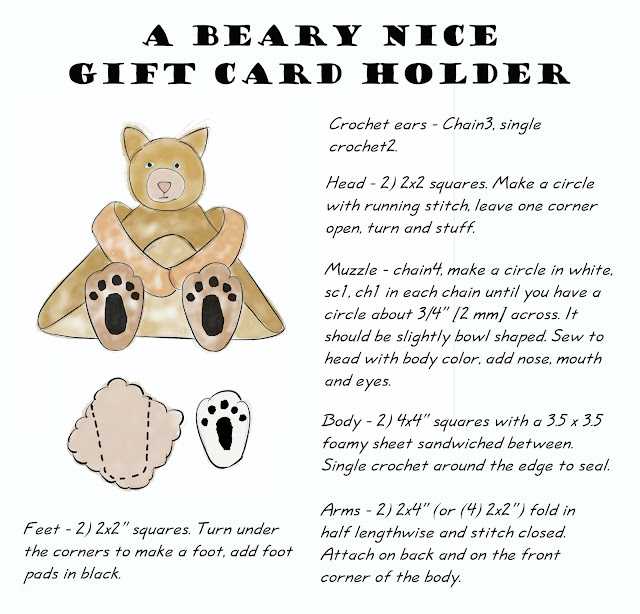 Once your start making these little woven pockets you may decide that they are perfect for gift cards, tree decorations and backpack embellishments. I like the idea that you can make them with some ease and match the gift recipient's favorite colors. 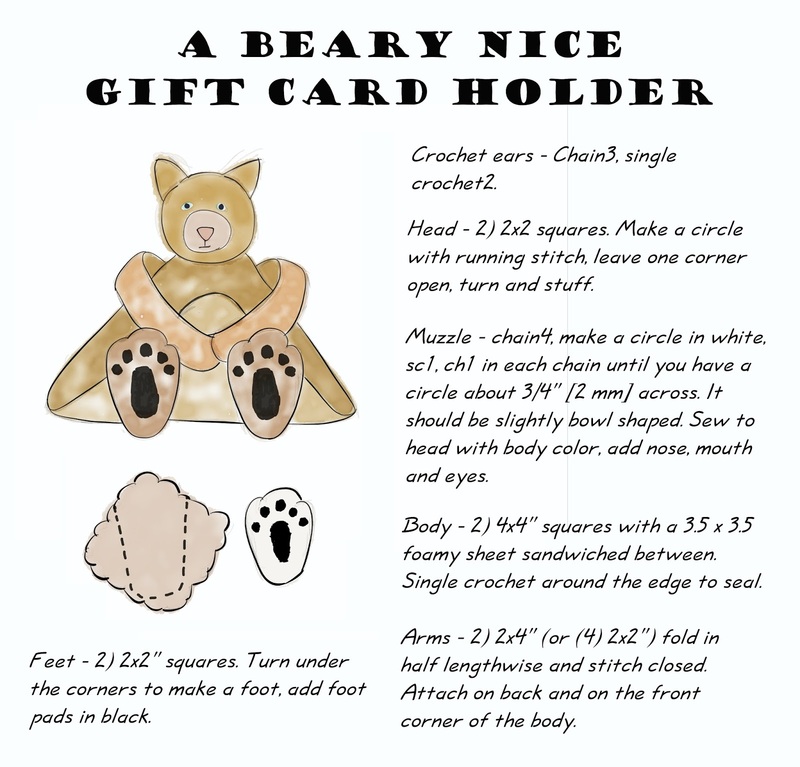 If your plan is to give some cash for Christmas, this makes a great way to give them a thoughtful, personal gift and still let people get what they want. This is a pattern that I worked out with the assistance and encouragement of a fellow Oregon Flock and Fiber participant. 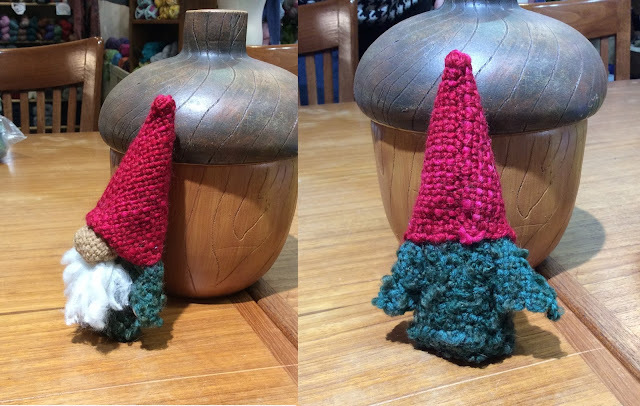 She mentioned that she wanted to make gnomes and we worked out just how fun and easy it would be to weave up Pin Loom Gnomes for the holidays! This is a fun little pattern that will have pin loom gnomes appearing everywhere this season. Add them to every sort of holiday decoration, make a few Gnome Wreaths, use them for that last minute stocking stuffer or have them popping out of every corner. They are so cute and easy to make that its hard to stop. So I wish you a very Gnomley holiday season! Its been forever since I have posted and that is not because there aren't wonderful things happening in the pin loom world. There is so much happening that its hard to stop and take a breath (and post something). Case in point, this backpack was made by Linda Wolf of Oregon. She created it in parallel with my book, Pin Loom Weaving To Go, which just shows that great minds think... about backpacks, I guess. This little project backpack began life as a rug. When I was a weaving student in 77-78, we were given the assignment to dye the yarns for our weaving project. 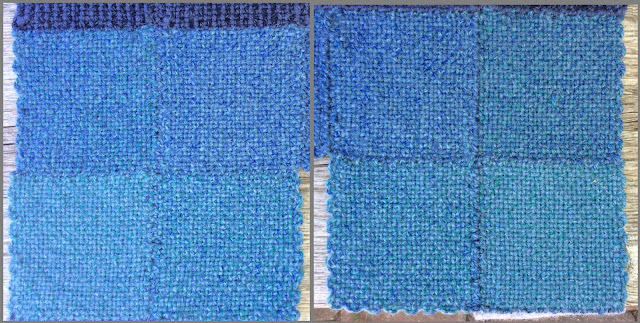 I dyed commercially spun wool yarn with commercial dyes (manufacturer of dye and yarn long forgotten) and made a rug which I used for many years. In the long run the warp chosen was not a good choice and gradually looked pretty ragged. I really didn't want to just toss the rug or give it to the dog so I pulled it apart. 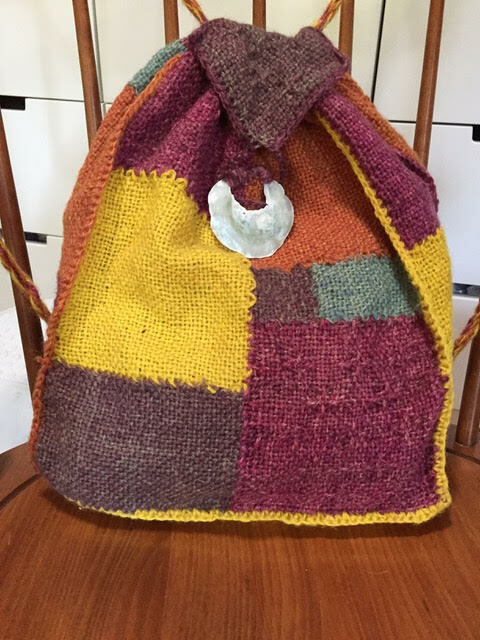 Some of the yarn was very tender so to maximize the yarn, I used my pin looms to create the pieces, sewed them together, then crocheted the large pieces together to form the backpack. I found the jingle shell on the beach which seemed like the perfect closure. I twisted a rope of the yarn for the straps using, "The Incredible Rope Machine". 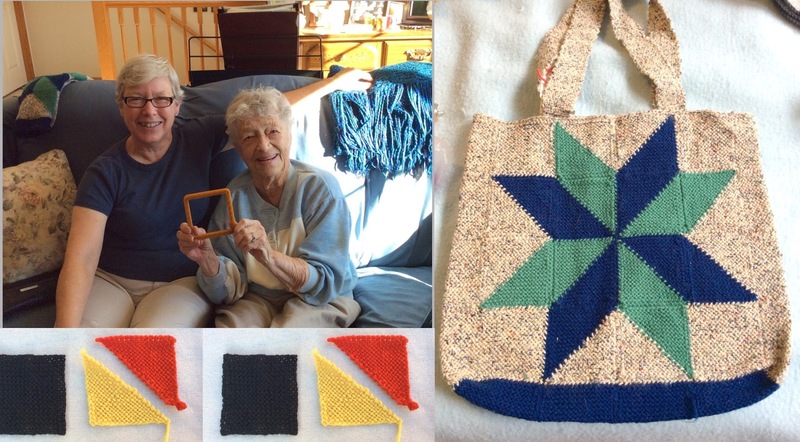 The judges were particularly impressed with the nice color placement of squares, the "upcycle" aspect of the project and the woven patterns in chosen squares, as was I.
I am blown away by someone actually taking the time to pull apart the rug in order to make these wonderful squares. If it had been my rug, it would still be sitting under several bags of other projects where I would point it out to people and explain how I was going to take it apart and turn it in to something wonderful... the difference being that Joyce actually did it and entered it in a competition. What I'm not doing enough of is looking around at the phenomenal approaches that others are taking with pin looms. So here are just a few of the wonderful projects I've run across. Each weaver gave me permission to share their incredible work. Laura's scarf takes advantage of the repeat in her yarn, with some active input from the weaver. 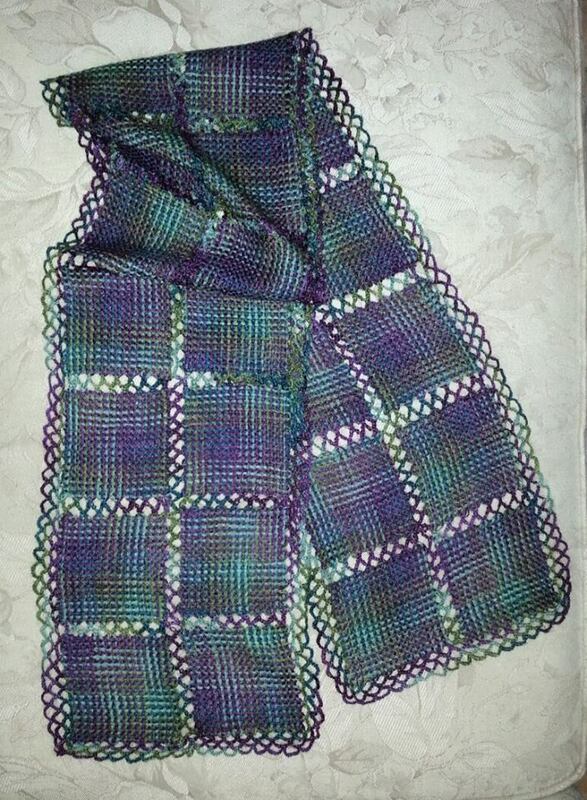 Laura noted, "I used double strand alpaca lace yarn. I had two balls so I could line up the repeat (or not as desired). I used one strand to chain 3 in a zig zag between two squares making two 12 square strips. Then chain 3 in a zig zag to attach the two strips to each other. The edge is chain 6 scallops from bump to bump with two in the same spot at the corners. I did three rows of it." Katheryn is likely not the first person to look at a 4" square and say, "you know, you could use that as a backing for rug hooking" but she is definitely singular in her range and output. I am blown away by the time, care and artistry in each woven, hooked square. Karen shared some pictures of her most recent purses. 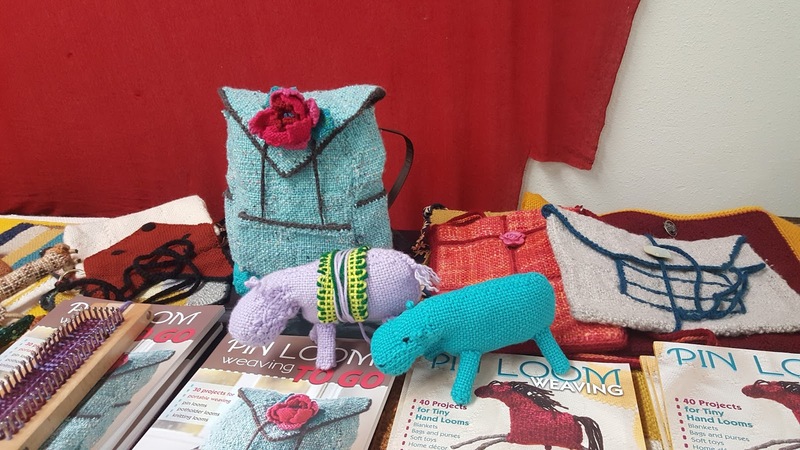 I particularly like her integration of two different loom products in the purse on the right. 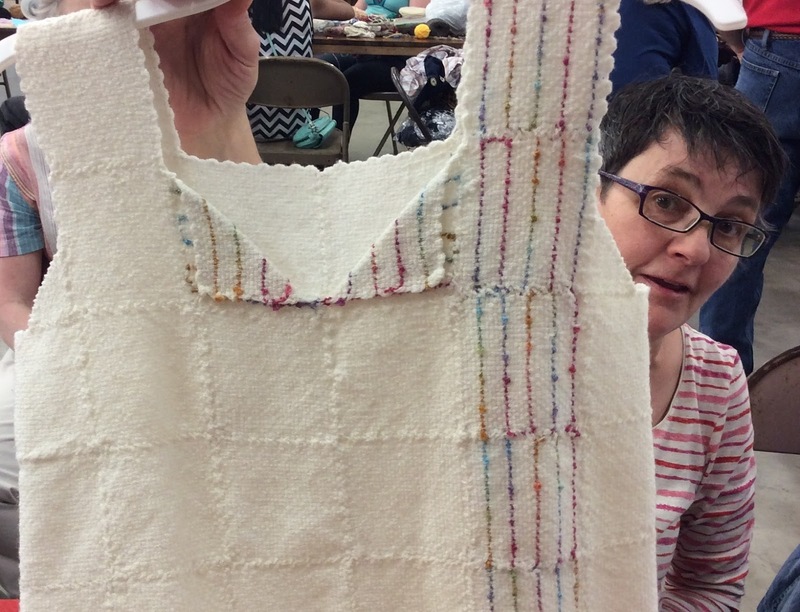 (And I am thrilled to see that she used some of my ideas in the Light Shoulder Purse. Karen wrote, "Here is my take on the Light Shoulder Purse. I used a white warp for 2 layers, one layer red warp and then wove green in chain stitch. Finished this a while ago, except the snaps and button covers. Made myself get it out and finish it now as this will be my Christmas purse. Found the Nutcracker pin to cover one of the snaps. I'm going to keep that in mind as a way to change the look on the more all season purse that is still sitting in yarn balls waiting for three other projects to be finished first. Enjoyed making the pattern. The other purse was a combination of techniques. Wove a (almost) square to finish a warp on the floor loom. It was approximately 26 x 28. Folded into a triangle and then folded the ends in. Wove squares and felted them for the cover on the bottom, partly to cover the seam. Wove small squares to fasten the rings for the handle. Turned out well. Want to try this as an all pin loom project in the future." Thank you, Karen. I could totally see this being a fun pin loom project. The ultimate Mother of Groom outfit! All proof of pin loom weavers doing thrilling work. Thank you so much for letting me share! If anyone out there hasn't checked out the Facebook Pin Loom Support Group yet, I would encourage you to sign up. You do have to request entry into this group but if you know what a pin loom is, you will feel very welcome and at home there. What I've only recently discovered is that this stitch works even better if you line up the squares so that the loops don't match up but instead are staggered. You then take two stitches through each pair as shown below. This may seem like a ridiculously small change but I think that it makes a better, smoother fabric. The other reason that I really like this join is that it is crazy strong. I primarily use it when I'm making a blanket on the basis that there is going to be quite a bit of stress on the seams due to the blanket weight and, if at all possible, I never want to have to go back and repair a hole in anything I've made. Here are a couple examples from a blanket I'm currently working on using this double overcast stitch through staggered loops. The finished side of the blanket is on the left, the underside of blanket is on the right. The finished side lies nice and flat, there is a discernible bump on the underside seam. Right side picture is the underside where I have not yet cleaned up all the yarn ends. One further update on joining techniques. 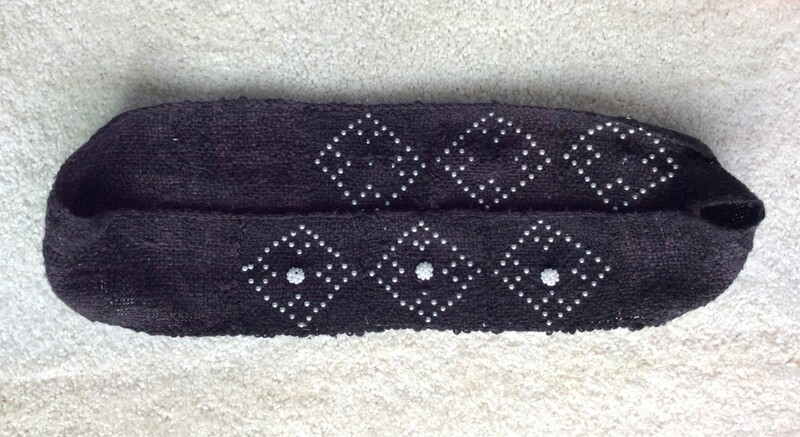 I recently ran into a lady in my local yarn shop who makes scarves using hairpin lace techniques. 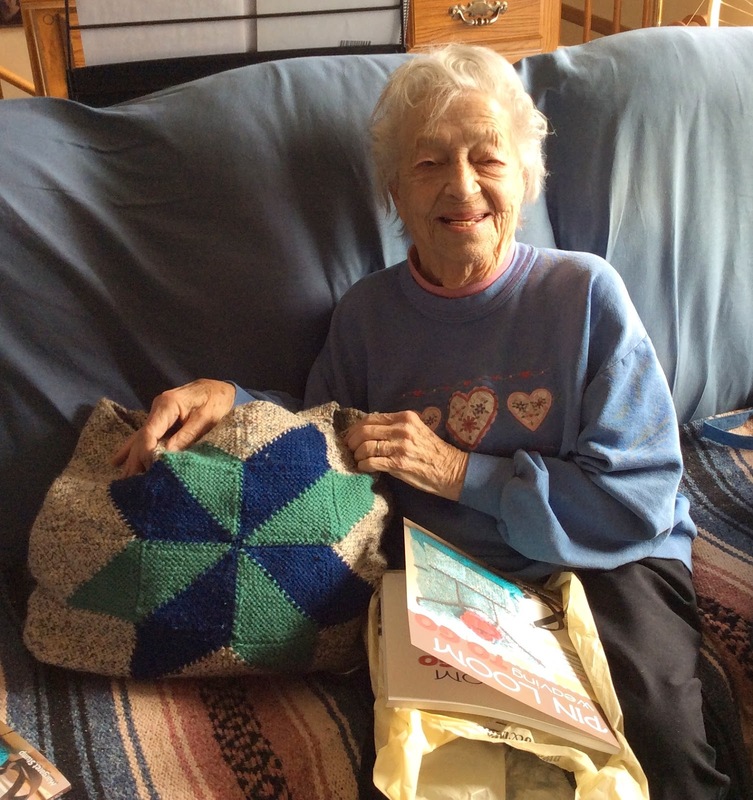 She showed me a join that works pretty satisfactorily with pin loom squares. You can see a video of the join at One Loop Joining Hairpin Lace Technique. It involves using a crochet hook to chain loops from the squares on an alternating basis to create a very snug and stable join. I have tried it a few times but have not yet figured out a way to make certain that the two squares stay perfectly lined up. So far, my attempts have led to the two squares being well joined but offset from one another. This will take some practice before I would use it in a project to be shared with others. I think that this join may work really well with pin loom squares that have been woven on a potholder loom. (This is a technique that is demonstrated in the most recent book, Pin Loom Weaving To Go.) 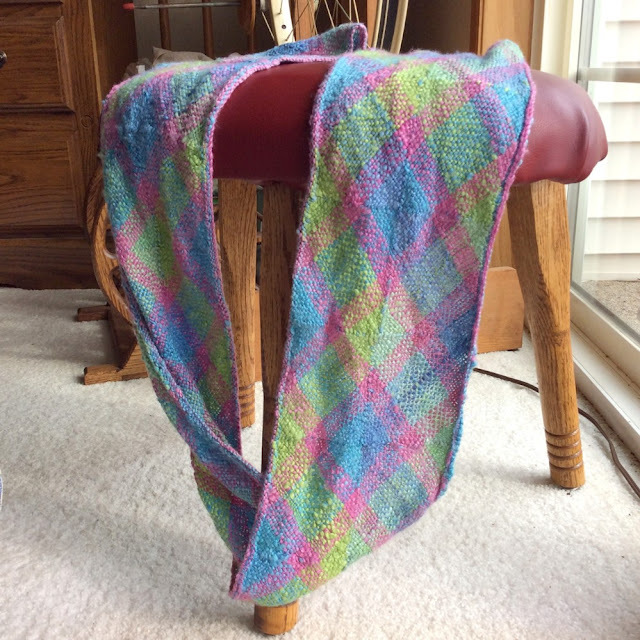 Because the potholder loom produces a much lighter, soft-woven square there would be more room to work and this join might be perfect for a scarf or shawl. So here it is, coming out this month, a new book of pin loom projects and techniques. I am extremely excited (and a little scared) to see it go out. Its like sending your youngest child off to school. 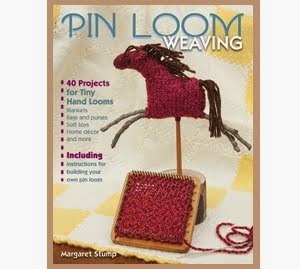 My original idea for this book was that pin looms can offer a fun, first step into fiber arts. So I included a number of beginner-type projects that would work for younger weavers or groups of kids or adults who are just beginning to weave. I included a simple to make 2" loom pattern so that kids could learn to both make and weave on a loom. 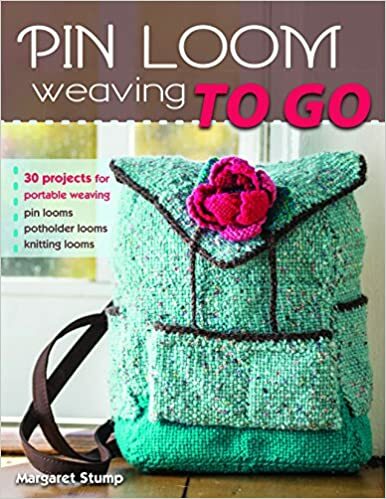 But then I started thinking about how so many of us had our first weaving experience on a potholder loom and how cool it would be if we could turn all the potholder looms into pin looms. 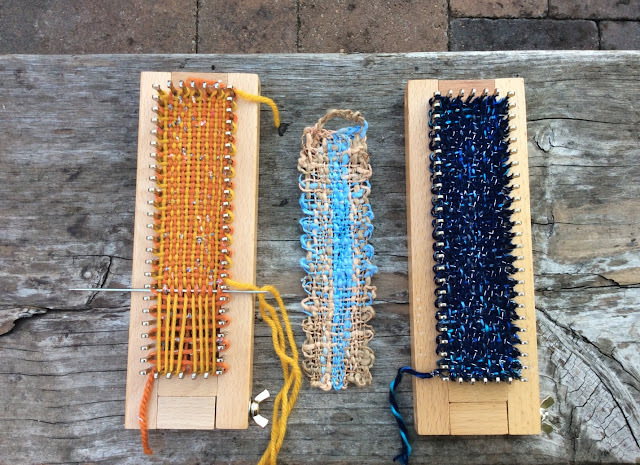 So I wrote a section on weaving in the pin loom fashion on a potholder loom. 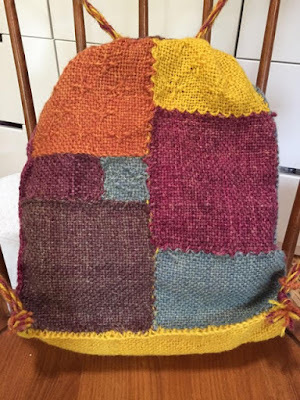 You use a potholder loom and a hook, I suggest using an afghan hook, and the directions teach how to weave a big square with finished edges so there is no need to finish with a crocheted edge when you pull it off the loom. There are also a number of projects, including scarves and shawls, to make on a potholder loom. But then I started thinking that if you could pin loom weave on a potholder loom, maybe you could pin loom weave on other available looms. After some experimentation I found that the 7" fine gauge adjustable knitting loom could be used as a pin loom to make an incredible variety of pin loomed fabrics. 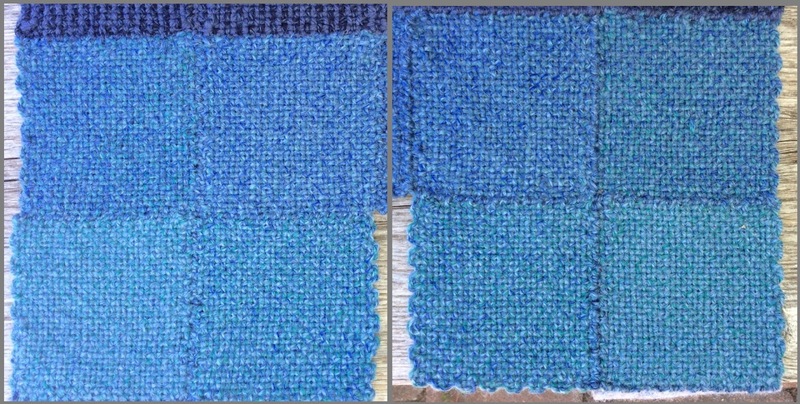 Techniques and projects for weaving on the knitting loom are also included in the book. These log cabin style pieces were woven on the knitting loom, the 2" pieces in the middle were woven on a 2" pin loom. And then I remembered a pin loom friend, Marilyn Wing, who has been pin loom weaving since 1936 and long ago perfected a continuous warp, bias weave on the pin loom. She was kind enough to permit me to share her directions for weaving on the bias on a zoom loom/pin loom as well as allowing us to all share in her wonderful quilted look bag pattern. By that time I had thought up a bunch of cool patterns for the 4" pin loom/Zoom Loom that I just couldn't leave out of the book. One of my favorites is the "Blooming Backpack" that appears on the cover. 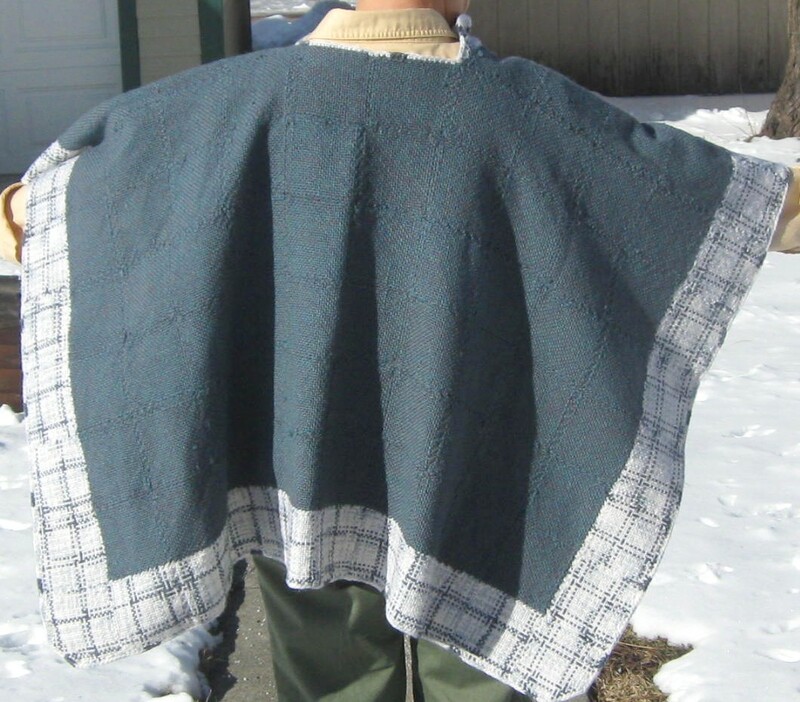 Another favorite is the Zoom Loom Blue Shawl shown below. Here is the finished pin loom ruana. I have found it to be comfortable and warm. I am amazed by the difference in the feel of the fabric after a very light washing/fulling. 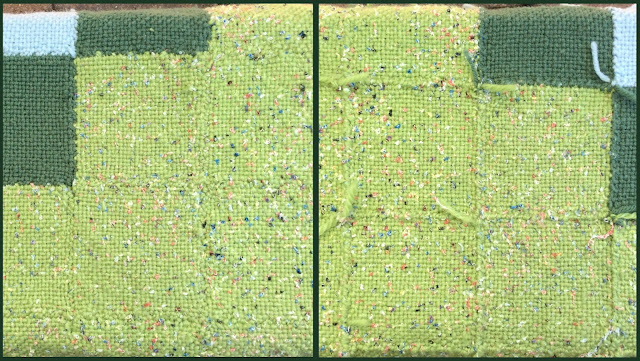 Before it was fulled, there was a feeling of it being a bunch of squares sewn together, afterwards it just felt like a supple fabric. My method of assembly closely followed the directions in the Pin Loom Weaving book. I joined the squares in strips using a double overcast stitch. I left several inches of yarn dangling on each side of the joined squares so that I could tie the strips together in order to keep the corners of the squares lined up. Before I washed it I went back over the lines of stitches to make sure that I hadn't skipped any stitches and left holes (I had). Once the holes were closed up, it was easy to finish. Since I still have yarn in the same color, the next challenge will be making pin loom mittens to match. My local yarn store expert pointed out that I didn't have to wash the ruana by hand in my tub. I could use the spin cycle in the washing machine if I was very careful not to let it go too long. I actually agitated it a little by hand and then let it spin out. Taking most of the water out with the spin cycle made a great difference in drying it. The ruana dimensions are 12 squares across by 14 squares long. This number would likely need to be increased for taller people. I wanted to leave enough room at the neck to make a comfortable opening so this is a sketch of the ruana front shown sideways. The two squares at the front of the neckline are folded diagonally and stitched down. I used the edging yarn to single crochet an edge all the way around the ruana. 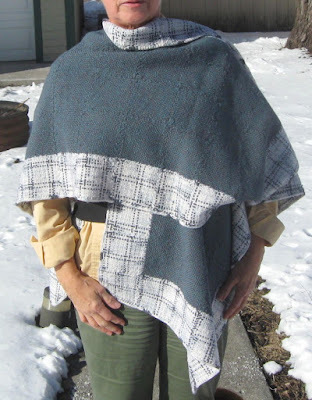 Here's the original information on my latest project, a pin loomed ruana... which is the name given for a poncho that is split open down the front. I am going to be adding pictures of the finished project in the next week or so. These pictures show an earlier stage, with most of the outfit still in piles of squares. It is now finished, but I need to full it slightly before there are more photos. I'm going to swish it around in the bathtub with a small amount of Neutragena basic shampoo to full it and then it using my steam iron to pull and flatten the seams while only very lightly touching the fabric. I found the yarn for the body of the ruana at a local church flea market. Someone had purchased six skeins of Germantown worsted weight wool yarn in "Glen Heather" and then carefully stowed them away for twenty years or so. Germantown may not be a currently available product but I think there is still an awful lot of it around, still waiting to be knitted, woven or crocheted. 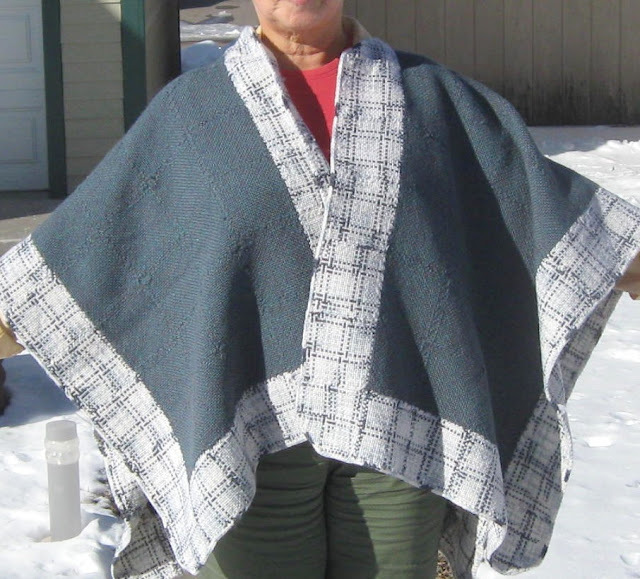 The Minnesota winter has been so cold this year that the idea of a cozy warm wool blanket shaped to fit my body has sustained me while weaving all the squares. Pattern details will be forthcoming but just to let you know, the finished piece in a size that works for my short stature has 168 squares. One problem that I ran into was that the Glen Heather fabric needed some contrasting color. I found several skeins of Raggi worsted weight on clearance and it turned out to be an incredible match. I love the way that the bits of dark grey assume an almost Celtic pattern in these edging squares. Finished pictures will go up as soon as the ruana is dry and blocked. I figure it will take a week or so for it to dry. In the meantime, this is a behind the scenes illustration of trying to take a picture of the woven squares with some unsolicited help.